This barmy idea was the first of my 10 Challenges 4 Cancer – these are ten adventurous endurance challenges I’m undertaking in 2013 to raise at least £2000 for the Association of International Cancer Research (AICR). This challenge was intended to push me to, and probably beyond, my physical and psychological limits. 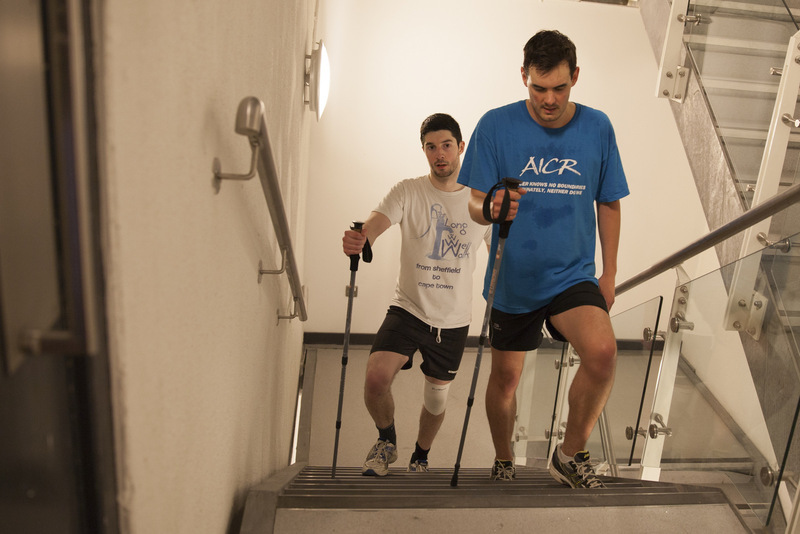 Our 8848m stair climb would involve 79 ascents of Yorkshire’s tallest building, Bridgewater Place, and a total of over 41,000 stairs! Just to make it a little more difficult we gave ourselves only 24 hours in which to complete the challenge. So after 17 long hours on the stairs (and a short break to sleep) we made it! I would like to thank Liam Garcia of the Long Well Walk for joining me on the climb. Without his company, I’m not sure I’d have stayed sane! In 2014, Liam will be walking from Sheffield to Cape Town to raise money for water sanitation projects across Africa. Thanks to Francesca Limb Photography for the imagery. Posted by Jon Maiden on March 27, 2013 in Fundraising, Microadventures and tagged 10 Challenges 4 Cancer, adventure, AICR, Bridgewater Place, climbing height of everest, endurance challenges, Everest stair climb, Liam Garcia, Long Well Walk, microadventure, physical challenges. Fantastic Jon. I love this challenge. All the best for your next energy sapping endeavour.